David Hu of the Georgia Institute of Technology presents “Eyelashes, Urination and Georgia Tech’s First Ig Nobel Prize” on Thursday. The winner of a 2015 Ig Nobel Prize in Physics will visit RIT on April 28 for a research talk and a workshop focusing on science communication. David Hu, associate professor of mechanical engineering and biology and adjunct professor of physics at the Georgia Institute of Technology, will present “Eyelashes, Urination and Georgia Tech’s First Ig Nobel Prize” from 11 a.m. to noon in the Golisano Institute for Sustainability Auditorium. Hu will share the wacky science that led to his Ig Nobel Prize. The talk is open to the RIT community. Hu’s research looks to the natural world for inspiration to build better devices. He has published in Nature and in Science. His work has been featured in The Economist, The New York Times, Highlights for Children, in the IMAX film Fire Ants 3D: The Invincible Army, on Good Morning America and on the NOVA series Gross Science. He is the author of the upcoming book Animotion: The Science of Animal Movement. 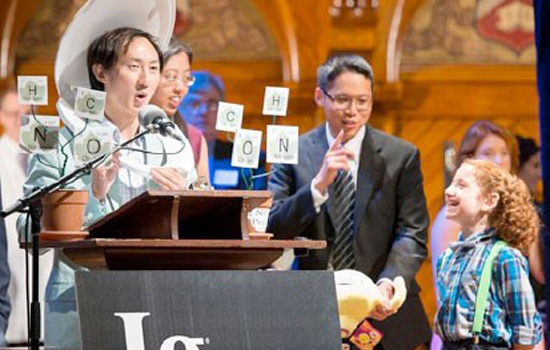 The Ig Nobel Prizes are awarded every September at Harvard University to honor unusual and imaginative achievements in a variety of disciplines. Hu’s visit is sponsored by an AdvanceRIT Connect Grant on science communication led by Callie Babbitt, associate professor in the Golisano Institute for Sustainability. The National Science Foundation-funded ADVANCE Institutional Transformation project seeks to increase the representation of women STEM (science, technology, engineering and mathematics) faculty at RIT and among campus leaders. Questions about the two events, reservations and workshop materials may be sent to Kara Maki, assistant professor in the School of Mathematical Sciences and event organizer, at kmaki@rit.edu.